Bomb technicians were called to inspect a golden mystery box with question marks on its side. When gamers see a golden box emblazoned with a question mark, the response is almost instinctual. You punch that sucker and snag yourself some coins. 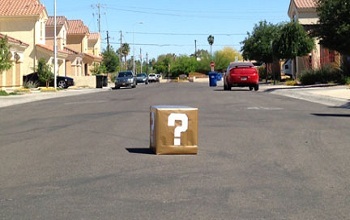 In the real world, on the other hand, the appearance of a mystery box can be a cause for fear and alarm, which is exactly what happened when police were called to investigate the appearance of a suspicious box with no small resemblance to the question blocks from Super Mario. Responding to reports from a passerby, police moved in to investigate the questionable package which had been left sitting in the road. As a precaution, officers evacuated around fifty people from nearby homes and blocked access to two streets while they waited for bomb experts to arrive. The technicians showed up at around 11 a.m and promptly opened the box. "Nothing of concern was in the cardboard box," said Molly Enright, a spokesperson for the Tempe police. Reportedly, the box contained only papers. The technicians gave the okay for people to return home at 11:30. The people of Tempe were understandably upset. "They made me leave the street. It's just crazy, a college town like this I wouldn't think that something like that would happen," said Andries Efthymious, a Tempe citizen who had called police to report the box. Others shared similar sentiments. "I'm glad that it was probably some messed up person that was trying to scare everyone instead of a real thing but that shows you it can happen anywhere," said Jen Trask, another local resident. While the videogame iconography branding the box is likely to amuse some, this incident is exactly the sort of the thing gaming community really doesn't need. Granted, no one knows the origins of the box, so it is possible this was all just an accident or a misunderstanding. It's even conceivable that, whoever did this, had no idea they were mimicking something from a game. That said, with many politicians pointing the finger at games as an instigator of violence, it's not in the slightest bit helpful to have something even remotely related to videogames be at the center of a real world panic.